The Wall Street Journal has an interesting article about healthcare in France. It details the financial difficulties that France’s national healthcare plan is experiencing. The data on this graph need a little explaining. It presents the percentage change in medical (not health as it states) cost in four countries. To accurately analyze the data you need to know what the rate of growth in GDP in these countries has been. If GDP rose greater than medical costs the problem of medical expense is a manageable problem. As the next graph shows, France growth in GDP has been anemic to non-existent. 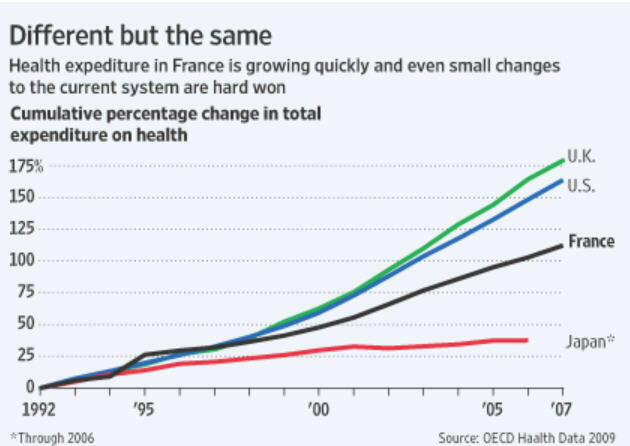 Thus the sharp rise in medical spending is a terrible strain on the French economy made worse by the French public’s unwillingness to confront its problem. The UK’s National Health Service seems to be in even worse shape. It’s never been considered to be a model of good medical care as has France’s system. But until the current world-wide recession the UK’s GDP has had a rate of growth much better than France. But last year GDP in the UK fell much more than France’s. This is going to put the NHS in Britain in even greater peril. The US with it’s strange amalgam of national (Medicare and Medicaid make up 50% of the country’s medical spending) and private medical care is in a similar situation. Until the economic collapse growth of GDP was pretty good. But like France and the UK medical spending has risen faster than GDP and is unsustainable. The Japanese seem to be doing better than than anyone else. Medical expenses have gone up far less than elsewhere. The Japanese have the longest life expectancy in the world. Commentators typically attribute this to the Japanese medical system’s focus on prevention which is wishful thinking. Prevention, however desirable it may be, doesn’t save money. The Japanese have the highest smoking rates in the world; the same is true for salt intake, hypertension, and suicide. Yet they live longer than anyone else. Why? Medical care likely has almost nothing to do with this longevity. The Japanese are a genetically homogeneous population. Their longevity is most likely the result of a good toss of the genetic dice. 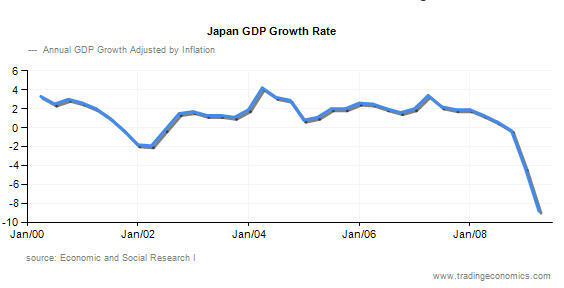 Japan’s GDP has not been robust over the past decade and fell off the cliff last year. The country’s expenditure as a percent of GDP will increase a lot more than it has before the economic downturn. Even without Japan’s current fiscal difficulties there ‘s not much we can learn from them. They are almost all the same. We are the most diverse country on earth. They willingly conform to national directives. We are notoriously unruly and resist regimentation. Their system cannot be transplanted to the US. Incidentally, organ transplantation is rare in Japan because it culturally unacceptable. Another difference between them and us. The European experience shows how medical care is too expensive no matter how you deliver it. The Canadians are also breaking their medical bank. Until we ask the essential question – why is medical care so expensive? – we will waste our time and worse our money on futile solutions that can’t possibly work. The Congress is currently considering ways to “reform” healthcare that have no element of reform in them. Rather they will make a deeply troubled “system” worse, more expensive, and slower.